I am looking for toy ideas and wheels. What are your favorite wheels? Do you like sandpaper vs no sandpaper? What toys do you like best? Is there any DIY or good places to look? What are the best and the safest toys? What do the gliders like best? Forage- What forage toys do y'all like best? Any puzzle ideas? I have a stealth wheel from Atticworx- I love it! It's quiet and my glider really likes it. I did have sandpaper on it originally to help with her nails, but recently upon cleaning realized it smelled so bad! It collects a lot of pee and poo. I did away with the sandpaper and plan on learning how to trim nails when we go to the vet. I also go on Etsy and find tons of different shops for sugar gliders. 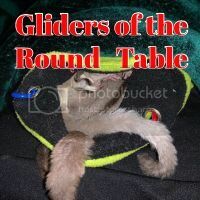 There are groups on facebook as well that you can check out like "Sugar Glider vendor Ads" and "Gliderlist". Now is a good time to hit the Dollar Stores/Dollar Tree, WalMart, Target, etc for their $1 or less bins. Go in with your "glider eyes" looking for things that are glider safe and would be fun play items. Just go up and down the isles looking for things they might like. Don't forget the Goodwill store for Fisher Price type items, like Farm Houses and things like that. Awesome what types of toys or materials should be avoided? My gliders love toddler shape sorters for the lots of holes to crawl in and out of. Just make sure the holes are at least 2 inches across to ensure your glider will not get stuck half way through the hole. Another big favorite here are Ferret Tunnels. I have 3 sections hung from the top of each of my cages. They love to hide out inside and sit at the openings to look around the room. The colorful tunnels are still clear enough for me to see the gliders inside and wide enough that two gliders can pass each other running through them. I'm very satisfied with the wheels I've purchased from Spinzone! Do you think they will like it? I do not see anything that they could get hurt on. Candy had a great idea for the ferret tunnels. Just make sure they are ferret NOT hamster tunnels. Gliders can and will get stuck in hamster tunnels. Last edited by KarenE; 02/11/16 11:54 AM. That is a great note about the hamster tunnels!! I was just eyeballing those and wondering. My fur-brats prefer forage toys, that is filled forage toys and their wheels. However some activities they enjoy, besides peeing on mom, is attacking the paper towels I use for clean up and some reset toys. They like to pick up some small plastic toys and chew a little, then toss it. They do also seem to like to explore floor toys, and hides. A lot of times they take their f/v or treats and sit inside or on top of the floor toys and eat it. During out of cage play, Lulu will usually be the first to wonder off and go bouncing(or hopping) across the floor to climb the big fleece wall (a fleece blanket hung over the towel racks in bathroom) and wait for me to come over to jump on. Skadoosh used to be the one to explore and climb the most, but hasn't done as much since the "incident". To explain the "incident": This happened a few years ago, when I had a happy routine of taking the gliders to the bathroom (glider-proofed, tiny bathroom). It was either before I homed Ollie, or after, but during quarantine, it was just the girls and I. Skadoosh would be the first to venture off and enjoyed climbing the shower curtain and gliding to me, Lulu preferred my bathrobe on the door hook. Both girls also enjoyed the towel bar and space saver. Skadoosh would be the most adventurous though, she'd find a way to scale the medicine cabinet and get to the top, as high as she could possibly get in our bathroom and glide down to me. Lulu, well she was not so much adventurous, lol. So when she scaled the shower curtain and wanted to jump to me, it was a BIG DEAL, lol. This one night, Skadoosh made her way to the top of the medicine cabinet, I was standing at the sink below, Lulu was climbing the shower curtain, and would stop to look at me like "well are you watching me? Are you coming over so I can jump to you?" ( because that's what they did when they climbed the shower curtain,btw). Anyway, I looked up at Skadoosh, and she looked like she was just going to do a little grooming up there, so I did it...I stepped away from the sink towards the tub and Lulu (who had made it to the top). Just as I stepped away (our bathroom was small, so it didn't have to be far) two things happened, Lulu jumped onto me, and Skadoosh jumped, oops I wasn't there for her landing. She went straight all the way to floor. She wasn't hurt, not physically, but she hasn't been so adventurous since. I feel bad letting her down like that, I hope one day she'll trust me again. We are thinking about trying some bathroom time this weekend. They are getting more adventurous with us so hoping they will enjoy it. I love bathroom time. My two spent a lot of time in the towels at first, but as we bonded they started playing on us more. They still love the towels and head there when they are done interacting. We have 3 towel racks along one wall so they have 6 bath towels to play on (and in). I don't bring a lot of toys in because they are fully entertained climbing, jumping, and gliding. They love the trash can, so I have to be careful to empty it or leave it in the hall. Bathroom time is where I get most of my interaction with my fur babies. I have a really small hall toilet that I take everything out of so they need me (at my treats) for entertainment. Sometimes I bring something like a cat teaser in that still has them interact with me. I love it! For example, last night way about two hours of the using me as a large tree & base of operations to see where they could reach, climb, & jump to/from. It was a blast to be a part of their antics! Actually, since we're on the subject of wheels in this post too, I'm ordering a new wheel for Steve from atticworx. Has anyone used the magnum wheel? The only thing I see about the magnum wheel is it's depth. Make sure your cage door is big enough to accommodate it's size. Last edited by Ladymagyver; 02/12/16 08:34 AM. I have a DCN on it's way, I was more worried about the track being metal instead of plastic. The metal is pvc coated. It should be fine. Huly, I'm not sure about the custom cruiser. I hope someone else can tell you about them. I wasn't sure about the wobble. I had a pretty cheesy cage when I bought my first wheel and was afraid it would have shaken the cage apart. I would love to hear about them too.i am looking for 1 or 2 more wheels. I have heard great things about them from research. Supposedly they have to jump/glide with them more than just run. That's the biggest difference I have heard. Looking for other opinions too. Okay I just have to put in a word for atticworx (stealth wheel although I ordered the magnum) I goofed and told them to ship it to my old address and had to call today to change it. I talked to a woman (Anita I'm assuming) and she was SO nice! She even let me know when it would be shipping without me asking about it. So far I'm really pleased with their customer service!